Many sellers have the impression that in order to sell a home, you just have to list it. While listing is certainly part of the process, there’s quite a bit of preparation to undertake before your home’s listing goes “live” on the MLS. This month, I’m sharing information about the steps to take when you’re thinking of selling your home. Selling is an emotional process, whether you’ve lived in the home for one year or 20 years. In addition to packing and making repairs and upgrades to get the home ready to view, you may also be busy looking for a new home to rent or buy. Page one offers general tips for sellers as well as tips targeted toward sellers who are trading up, that is, selling a smaller home in order to buy a larger one. 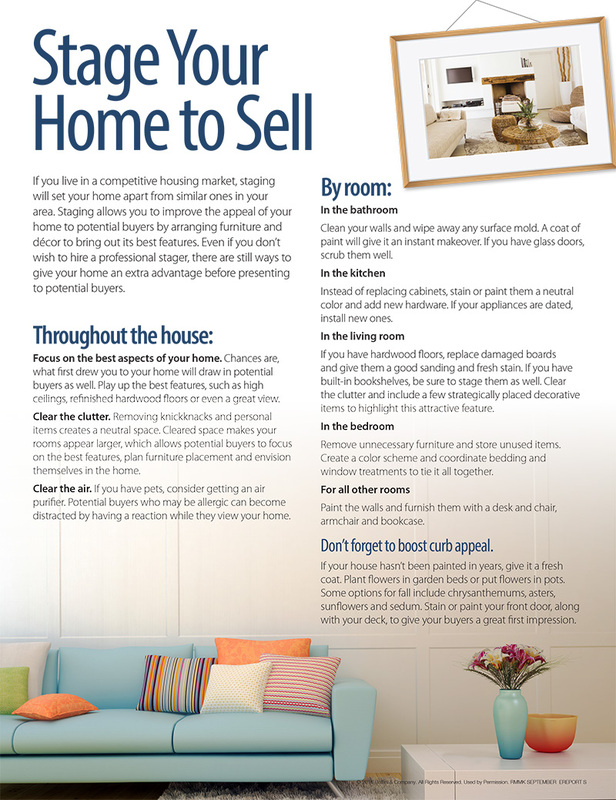 Page two offers tips for the seller who is downsizing, or selling a large home in order to buy a smaller home. Whether you’re upsizing, downsizing or buying a similar home in another neighborhood, give us a call! We can address all of your questions and concerns and offer our expertise to help your home stand out in our market.